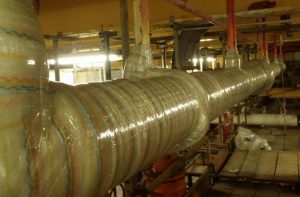 Corrosion and other anomalies on piping are often temporarily repaired with various types of composite wraps. The ‘wrapped’ repairs are difficult to inspect, resulting in a requirement for a permanent repair by a due date, irrespective of the integrity of the temporary repair. This work normally requires a plant shutdown with consequential additional POB, cost and operational disruption. A unique inspection technique has been developed and class approved which enables the integrity of the temporary repair to be assessed whilst in-service. The WrapSight™ methodology developed by Inversa and EM&I uses a combination of advanced NDT methods including Backscatter Computed Tomography (BCT) to determine the condition of the repair material and the underlying piping. A prioritised Inspection Plan optimises cost, operational efficiency and programme. The complete Temporary Repair Management Service comprises, Temporary Repair Register (set-up and management), Risk Based Inspection Plan, In-service Inspections, Reports with Recommendations, Repair Supervision and Close Out Inspection Report for compliance certification. WrapSight™ avoids unnecessary repairs saving at least 25% of the overall programme cost. WrapSight™ inspections are carried out during normal operations and the results used to improve shutdown planning and reduce POB. WrapSight™ is ABS approved and supports a compliant Temporary Repair Management programme.